A Muslim stonemason in France has been immortalised by having his face carved on a gargoyle on the side of the medieval cathedral in Lyon. 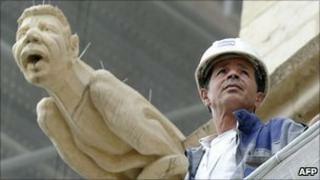 Ahmed Benzizine - a 59-year-old master mason who worked on the renovation - was used as a model for the carving. Next to it is an inscription in Arabic and French which reads: Allahu Akbar, God is Great. But a local far-right group has said the carving is an affront to the Catholic Church. Fellow stonemason Emmanuel Fourchet decided to carve the gargoyle, nicknamed Ahmed, in tribute to his friend, with whom he has worked on the renovation of religious buildings for several decades. "I'm a Frenchman and a practising Muslim and I've always worked on historic monuments. I could work on mosques or synagogues as well," Mr Benzizine told the AFP news agency. "I have a lot of respect for sacred places," he said, adding it had been a tradition since the church was first built in the 12th Century for stonemasons to appear as caricatures on gargoyles. But the carving has been denounced by Les Jeunes Identitaires Lyonnais, a right-wing group which says it defends the region's traditional "ethnic and cultural identity". "While in many Muslim countries, Christianity is forbidden and Christians persecuted, in Lyon, Muslims take over our churches at their leisure with the complicity of Catholic authorities," the group said on its website. The church authorities are unperturbed, says the BBC's Hugh Schofield in Paris. Since time immemorial, they say, outside church carvings have reflected - often humorously - the surrounding society - and what better symbol of coexistence than a Muslim gargoyle, he adds. "There was no opposition, and no particular authorisation on the behalf of the Church," says church spokesman Pierre Durieux. "In history, gargoyles were always profane figures and a chance for irony and satire. In any case, they're not inside the church," he said.